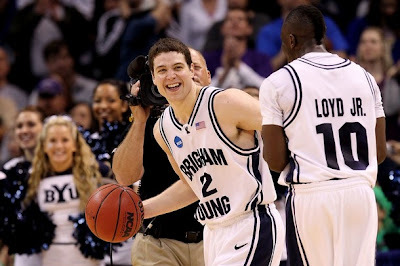 Jimmer Fredette had 37 points in the 2OT BYU win over Florida in the first round of the NCAA tournament. Fredette was held scoreless in the first OT but came alive to take over the second overtime with 10 points including a big three pointer, he also added a strong defensive effort in the OT. Jimmer Fredette is a joy to watch as he usually hits his free throws (he did miss 2 in the second OT) he drives to the hoop with a variety of moves, he shoots well from beyond the arc, and he is the point guard getting his teammates involved when he is covered. Fredette was 13 of 26 from the field and 3 of 8 from beyond the arc. The only fault you could find in Fredette's game is that he did have 5 turnovers but considering how much he has the ball in his hands that isn't bad. Fredette was given surprise help in the first round game by Michael Loyde Jr. who also had a fantastic game with 26 points on 7 of 10 shooting from the field and 3 of 5 from three point range.